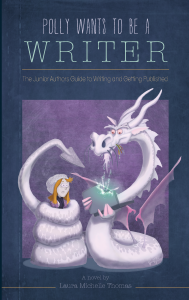 Our own Canada West Blogger, Avery St. Pierre, just finished reading Polly Wants to Be a Writer: The Junior Authors Guide to Writing and Getting Published. Here’s what she had to say. An exciting and entertaining work of fiction paired easily with non-fiction ideas to help young writers along their course, Polly Wants To Be A Writer is a genius tale crafted specifically for the young writers of today. I enjoyed the story with its different characters and rich settings, getting lost in the pages as I followed Polly on her journey to becoming a great author. More than the story, though, I found that I learned more about the writing process and how to inspire myself throughout the tale. Everything was woven seamlessly together as Thomas skillfully introjects the lessons into the prose. The novel bridges a lot of age groups. It read like something meant for the eleven to fourteen age group, but has appeal for people older or younger due to the easy language, fun characters and important lessons. I’ve worked with Laura for a little over six months now, and this novel really lets you know exactly how she is as a person. She truly strives to help young people and answer their every question, just like the story’s Ms. Patience Whitford. I, like Polly, fall under the category of “budding female author of fifteen years old” but, unlike Polly, I developed my love of writing before my dragon was born. In the novel, Ms. Whitford explains that literary dragons – the part of an author that allows them to edit their work into something worth publishing – come around puberty, which was very true for me. I fell in love with the craft at about the age of nine and would almost write every day from six in the morning until school and then five until bedtime. My mother worried for me. But it wasn’t until I was about twelve or thirteen that I started to find ways to polish my completed work. In this way, me and the main character are very different. Because I was so far into the habit of writing, I rarely ever got serious writer’s block – until this year. Reading Thomas’ novel, I came to realize that the reason I hadn’t produced anything I’d been proud of for months was because my own literary dragon (who I have named Petra) has been snacking upon my words and eating at my subconscious. Polly, Ms. Whitford, Scrum, and even to a certain degree Dr. Mammozarak, have shown me that the only way I can ever become a professional writer is to muzzle my inner dragon and put the words down on the page. Polly Wants To Be A Writer is a book worth five stars for its ability to be both an informative non-fiction as well as an entertaining story. It has a cute plot and richly formed characters. I would recommend it to anyone ages nine and up who dreams of being an author, or who has the unfortunate duty of being one of those parents who has to deal with us aspiring writers and our extensive piles of journals. I hope you will enjoy Polly and her journey just as much as I did. Good luck taming your dragons!